Download mediAvatar Ringtone Maker for free now and make your own ringtones! Make ringtones (MP3, WAV, M4R, AMR, AMR(3G), M4A, OGG) from most audio formats including WMA, WAV, RA, M4A, AAC, AC3, OGG and MP3. Extract audio from video files (AVI, MPEG, WMV, DivX, MP4, H.264/AVC, AVCHD, MKV, RM, MOV, XviD, 3GP, etc.) and convert them into ringtones. This ringtone maker is available for making ringtones for iPhone, BlackBerry, Google phone, Windows Mobile, Nokia, Motorola, Sony Ericsson, LG, HTC or others. Making a ringtone is simple as 1-2-3: 1. drag and drop to add a video or audio file; 2. choose ringtone format you want; 3. hit one button to make a ringtone! Apply fade-in and fade-out effects to the ringtone, making your ringtone special. This ringtone creator allows you to extract and convert any video/music segment into a ringtone by setting its start and end time (accurate to milliseconds). Make your favorite segment into your own ringtone now! To check whether the segment to be converted, fading effects and ringtone volume are just what you want, you can play the ringtone via the built-in music player before making ringtone. 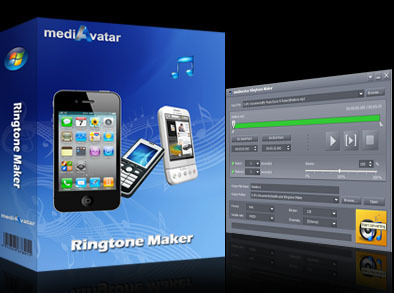 mediAvatar Ringtone Maker is available in English, German, Spanish, Italian and French interface languages. Create unique ringtones for you iPhone from existing music; no need to purchase ringtones online.